Amino acids are the building blocks of your muscles. If your body does not get enough amino acids your muscle soreness will last longer, you won’t get as big and you can’t train as intensively. The branched chain amino acids in particular are essential to protein synthesis, and therefore invaluable if you want to get really big. BCAA consists of the three amino acids L-Isoleucine, L-Leucine and L-Valine. The use of BCAA Ethyl Ester before and immediately after a workout prevents catabolism (prevents muscle loss), increases glycogen (energy for the muscles) and contributes significantly to a hormonal balance that is aimed at building bigger muscles. Other anabolic functions in your body, like protein synthesis and nitrogen retention, are also stimulated. 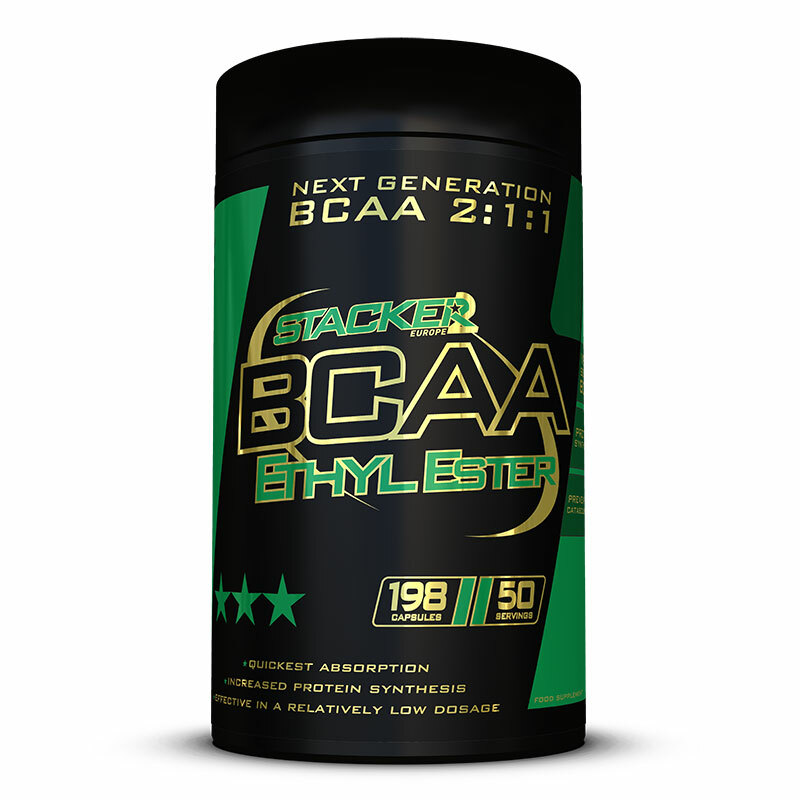 By linking the ethyl ester to the branched chain amino acids this Stacker2 Europe product is many times more effective than regular BCAA products. Ethyl ester is absorbed perfectly by the body and therefore takes the amino acids into the bloodstream completely intact and without the need for digestion, whereas old-style BCAA supplements would largely be destroyed in the stomach and therefore fail to work. 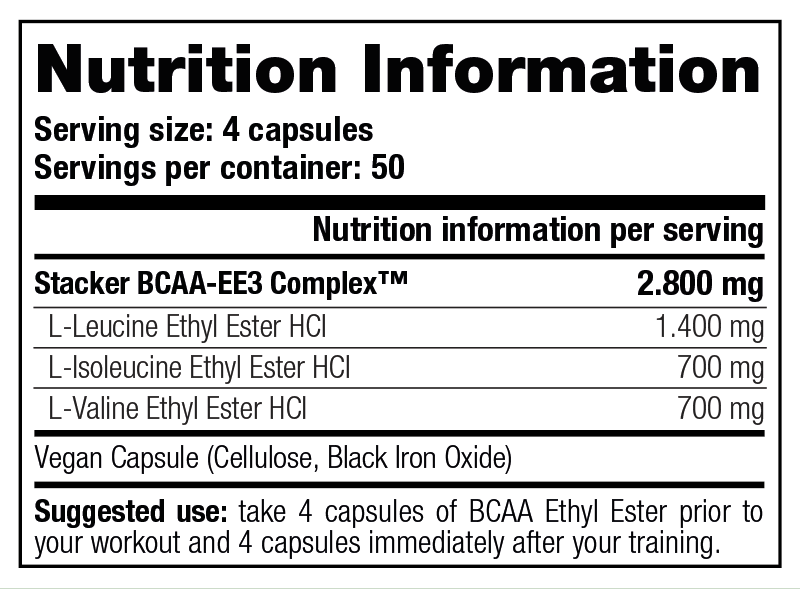 BCAA Ethyl Ester works faster, works better and is more effective in relatively low doses. This is a food supplement. Food supplements should not be used as a substitute for a varied diet. This product is to be used in conjunction with a sensible diet and exercise program for best results. Please store in a cool, dry place and keep out of reach of children. This product is not intended for anyone under the age of 18. This product is not intended to diagnose, treat, cure or prevent any disease. Never exceed the recommended serving. Take 4 capsules of BCAA Ethyl Ester prior to your workout and 4 capsules immediately after your training. What is the advantage of quicker absorption of BCAAs? BCAAs are the most important amino acids. They prevent muscle breakdown and muscle stress. The muscles are crying out for BCAAs immediately after training and it is important to take them as soon as possible. BCAA Ethyl Ester is absorbed more fully and rapidly than ordinary BCAA and can be seen as the best product for everyone who wants only the best. Should I take BCAAs before my shake, during the shake, or after my shake? It would be best for you to take BCAAs before the protein shake. Only in this way do you benefit from the rapid absorption of BCAA. A protein shake namely slows down your digestion. Can I also take BCAA just before a workout? Yes, during an intensive workout, the body uses up plenty of amino acids. A quick supplementation can counteract excessive muscle breakdown. In that case, take 4 capsules of BCAA Ethyl Ester half an hour before your workout and 4 capsules immediately after the workout. In order to view a lab test, you need a PDF reader (e.g. Adobe Acrobat Reader). Click on the banner below to read more about our 'guaranteed quality and anti-doping programme'.